Andy Green asked me to design him a website that presented and showcased his homemade guitar effects pedals and allowed him to update a news section himself. The page also includes feeds from Instagram and Twitter as Andy is very active on social media in promoting his new products. 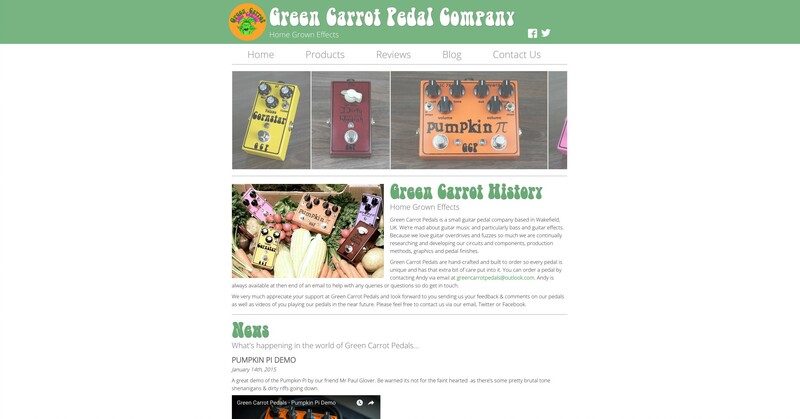 When I first started up Green Carrot Pedals, I knew I wanted a website. I wanted an ‘all singing, all dancing’ that looked professional that was easy it navigate & user friendly. I wanted everything but had no idea how to do it or where to start. That’s where James came in and saved the day. He took my ideas & vision, together with some great ideas of his own & produced a great website for GCP. Throughout the entire process, there was a free flow of information & feedback between James and myself. Website milestones were discussed and time bound. James was open to my questions even the very simple ones. James made the whole venture as stress free as possible with the end result a great website for Green Carrot Pedals.